First, I want to make clear that my reviews often get spread out in a bunch of different areas and are posted to various sites. I was given a copy of this book to review by No Starch Press, but I am an independent reviewer and have no connection or financial incentives in the books or in their publisher in the US or elsewhere. I feel it important to mention this when I do book reviews and post them, so that people realize my review may appear in multiple places, but it will appear in TESTHEAD first unless otherwise agreed to (i.e. my O’Reilly Reviews appear there first and then on my site later). First and foremost, this is a fun title. It’s fun because of course it’s a manga, and usually manga titles are dramatic, silly, funny, poignant and ridiculous… often all at the same time. It’s part o the charm of the medium. No starch Press has released their latest installment of “The Manga Guide to…” series, and this time they are taking on a whopper of a topic… The Universe! For me personally, there is a level of fascination to this topic that goes beyond my interest in the stars and what might be “out there”. This is also a great book to open one’s eyes to epistemology, or the study of what we know and why we think we know it. At the beginning of the series “The Day the Universe Changed” (BBC series from the 80’s), James Burke starts out and says that a student or colleague of the philosopher Wittgenstein was talking to him, and commented on the fact that previous generations were so foolish to believe that the Earth was the center of the universe, when clearly the Earth and the Moon revolve around the Sun. Wittgenstein’s answer was quite clever. He said “Yes, I suppose so. But I wonder what it would look like if the Sun really did revolve around the Earth.” His point being, from our vantage point… it would look exactly the same! It’s with these ideas in mind that "The Manga Guide to the Universe" begins its exploration of the Universe. It starts with our three protagonists trying to come up with a topic and a script for their drama club. If they don’t, they will have to close own the club (cue stock music for tense drama ;) ). One of the stories they consider is the Legend of the Bamboo Cutter, and ancient folk tale within Japan and a telling story of a belief in extra-terrestrial life. It’s from this area that we are introduced to the main character’s brother and his Professor who teaches about astronomy and astrophysics. The first part of the book discusses the discoveries and setbacks that scientists had faced over millennia to explain their world and its lace in the cosmos. We go from Ancient Egypt and Ancient Japan, through to the discoveries of the Greeks and the scientists in the Middle ages, the renaissance and beyond, to show how we grew to understand, postulate, test and finally prove that our place in the universe was not the center, with everything revolving around us, but that we were, to quote an old show from my youth, “a big blue marble in space”, rotating around a sun the way the other planets in our solar system do. Like other books in The Manga Guide to…” series, each chapter is broken up into story panels like a traditional manga, but then a few pages of description, mathematics or physics will go into greater depth about the topics just covered. You will learn a lot from just the manga panels, but you’ll learn much more from reading the explanation pages, too. The story develops with the student trying to find a way for the star of their play (a girl found inside of a stalk of bamboo by the bamboo cutter) that declares she’s from another world and must return there. the search for a possible home for the girl is the development that leads the exploration through an out of our solar system, into the Milky Way galaxy, beyond our galaxy to local groups and the ultimate size and shape (we think) of our universe, and the various theories that help us measure these ideas. What I found to be most valuable, again, goes back to epistemology, and showing what we have learned over the years, and how testing that knowledge has either reinforced ideas, or led us to new ideas. The mathematics used in this book are, well, daunting and massive. The sheer size of the universe as we perceive it is breathtaking, and it’s exactly this order of magnitude thinking that makes this book refreshing and fun. Rather than drown the user in gigantic numbers, we see variations such as astronomical units (1 AU is the radius of the distance of the Earth to the Sun). From there, calculations using triangulation and other geometric means help explain how we can determine the massive distances, and also explain some thoughts about the potential of multiverses or a “curved universe’ where the edge of the universe is reached when we come back to our starting point. Confused? After reading this book, you won’t be (well, again, it’s theory and pretty wild stuff, but you can definitely appreciate the logic behind it. Do no think to yourself “children’s book” when you see this title. This covers some intense stuff that adults might find hard to follow. Astronomy, Astrophysics, Cosmology and even Science Fiction (appreciating the structure of and the keeping a world view coherent) are covered in this title. For fans of these sciences, this is a slam dunk. 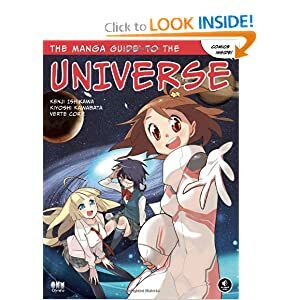 The Manga Guide to the Universe is a fun and engaging title. To my fellow testers, all of the above are true, but read it for a greater appreciation of how we acquire knowledge, and how each discovery is connected to those that came before. Testers will also appreciate the fact that our forefathers, having ancient an rudimentary tools, worked out remarkable solutions for their day, and some ancient discoveries still stand the test of time; if not 100% accurate, they are really close. So if I have piqued your interest, check out this fun and engaging book. Even if manga isn’t your thing, there’s plenty here to keep even hardened science geeks and armchair astronomers engaged.